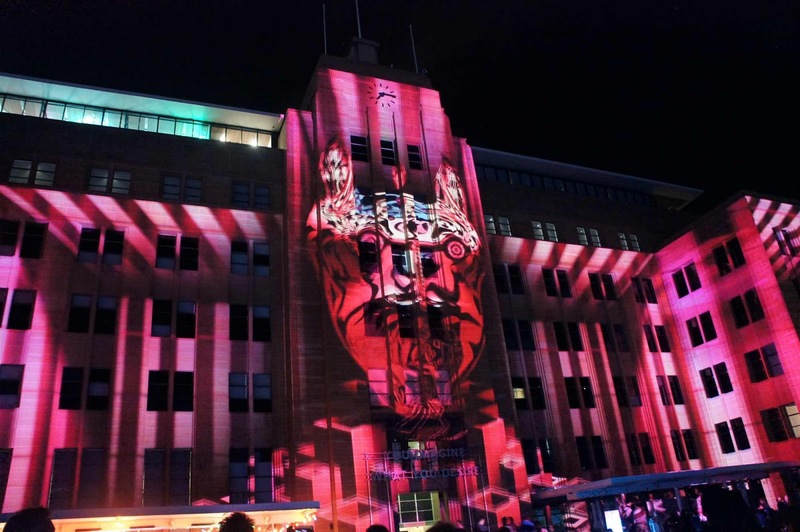 Sydney Shop Girl: Vivid 2014. It's official, Sydney. This has been the sunniest May we've had for a very long time, if not ever. What's more, the clear skies and warm sunshine don't look to be going anywhere for quite some time so enjoy it while you can. Not that I need to be asked twice. I've been basking in the sun and keeping it classy yet comfy with track pants and my new deck shoe inspired Crocs. The pins give away where they came from and yes, Toddler SSG's new pair also feature Disney's original mousey super couple too. Fancy beef bourguingnon pies from Costco. Bought for Toddler SSG but devoured by me. 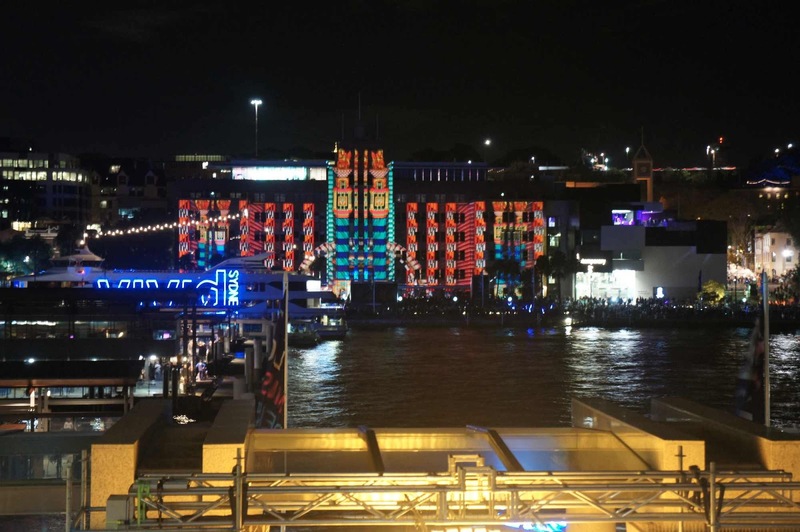 I did my civic duty last night and dropped in to Vivid. But not before I had a super early dinner at home. Turned out to be a wise move because all the food stalls at the festival had enormous queues stretched out in front of them by the time I hit the city at 6.30pm. 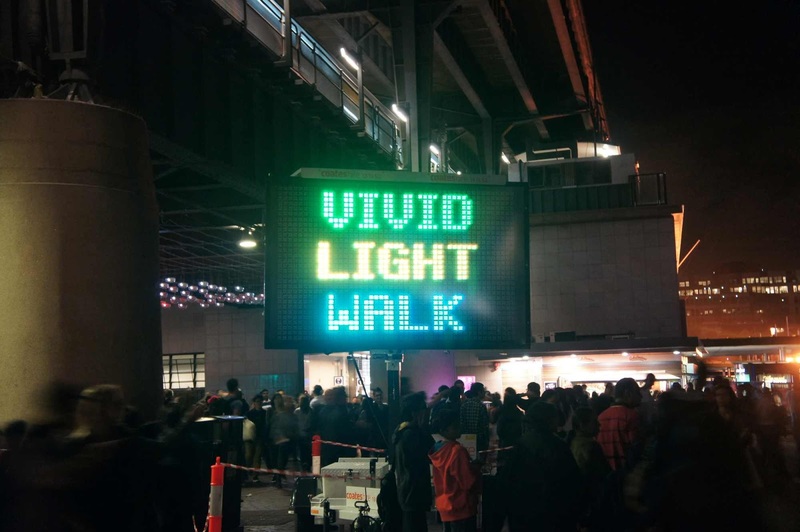 It's been a few years since I last attended Vivid Sydney and I was rewarded with a collection of installations that were completely different to anything I remember for previous Vivids. 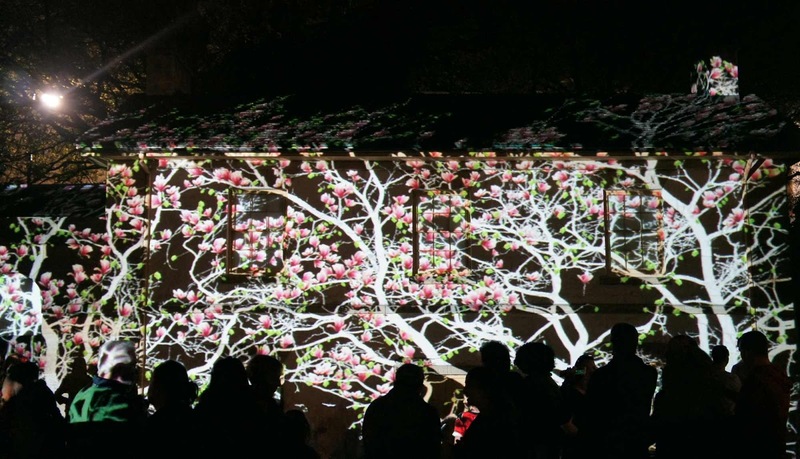 This year's organizers have done a great job in selecting works that appeal to a wide cross section of Sydneysiders and tourists. 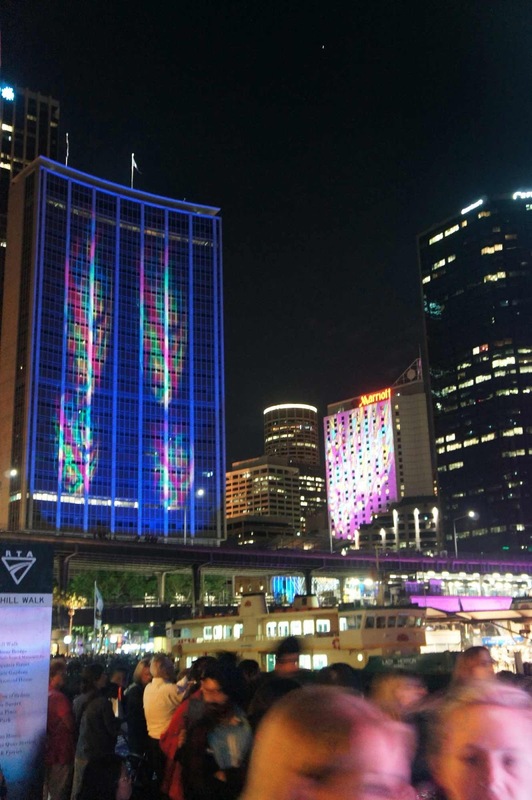 Also, the key locations of Martin Place, The Rocks, Darling Harbour and Circular Quay flowed easily for attendees - most of which were on foot, pram or a bit of both. 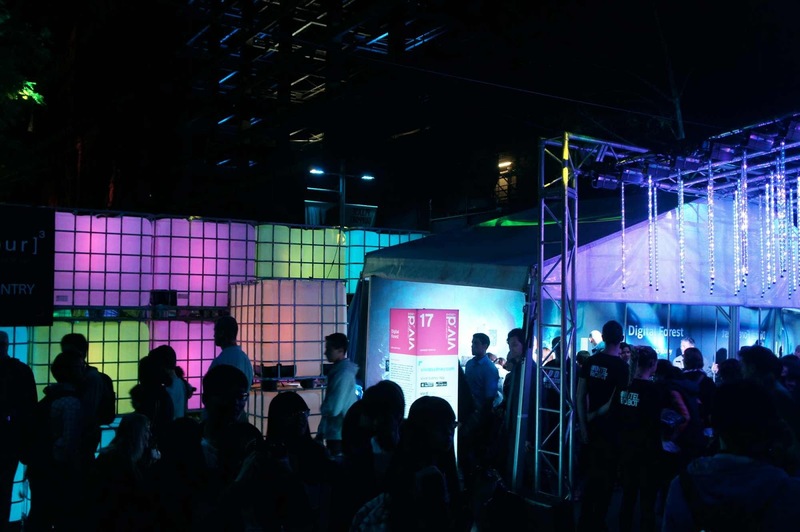 In addition to the free programme, there is a concurrent ticketted music program, markets and bar areas. To be honest, I couldn't even get through the free stuff in one evening - there was so much to see. 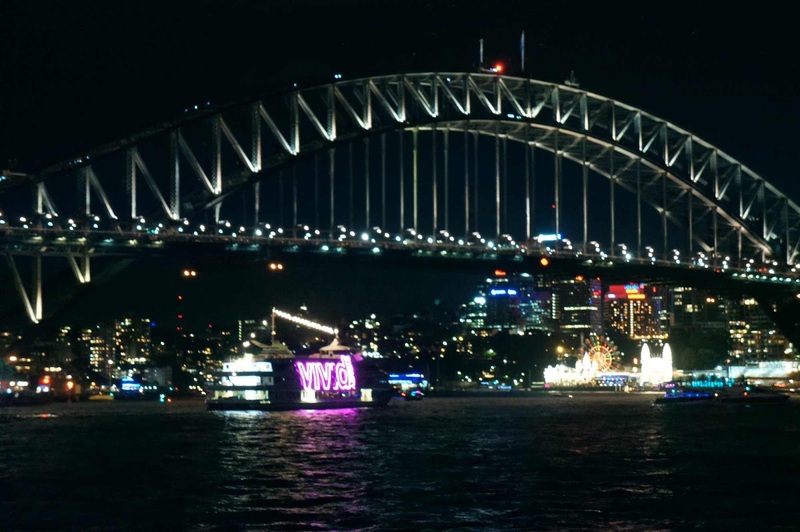 This year's event has been widely promoted and Sydney has heeded the call. The crowds only got bigger as the evening progressed and it was a good call by the City of Sydney to close off key streets of the CBD to cars and buses. The pedestrian only rule made it possible for everyone to enjoy the night safely and at their own pace. 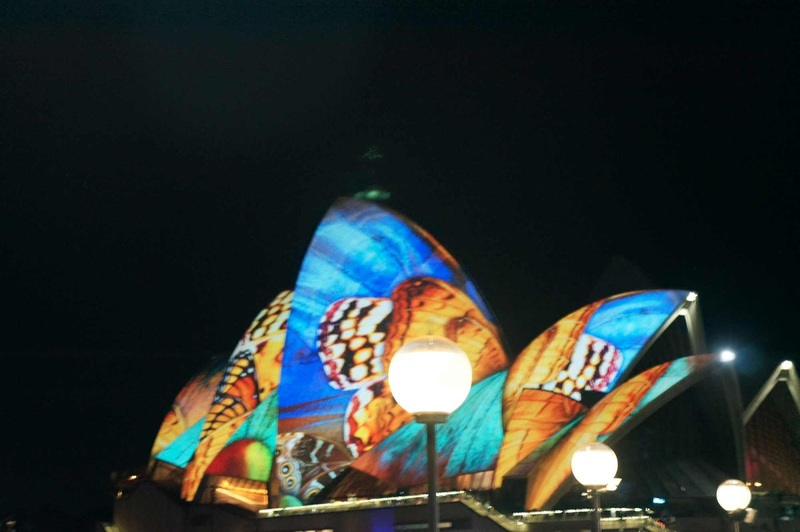 I began at Martin Place and looped through Circular Quay and The Rocks last night. I discovered the movement reduction function on my camera in the nick of time so I actually have a few Opera House shots that were mostly focussed. 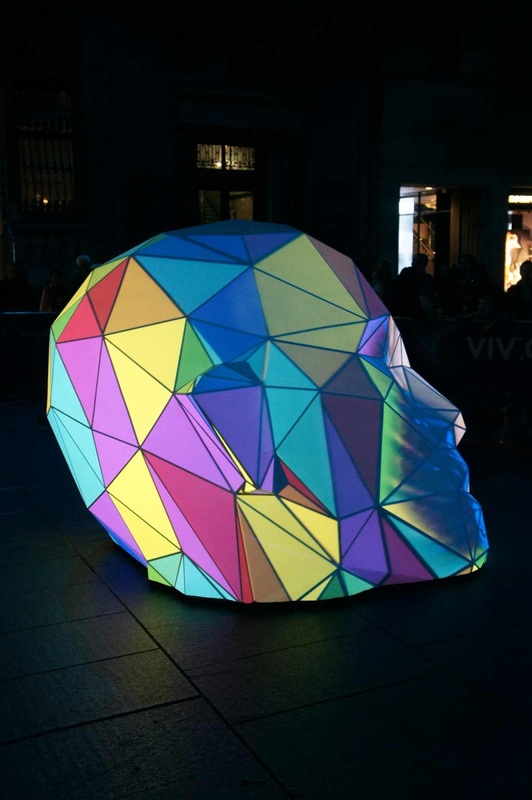 e|MERGEnce is the name of the large glass skull that greets you at Martin Place. During the day, it's an unobtrusive white sculpture but at night, it lights up and its 'face' mimics that of the people who face it. 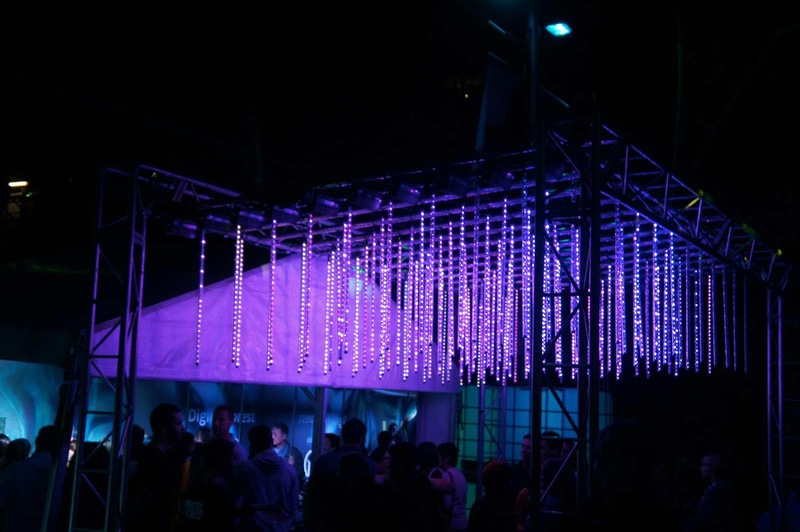 Further along the way is Digital Forest, 120 3D LED lights (now that's a tongue twister) suspended from a metal frame. You can enjoy a drink at the cube bar behind the forest and watch the world go by in a haze of purple light. 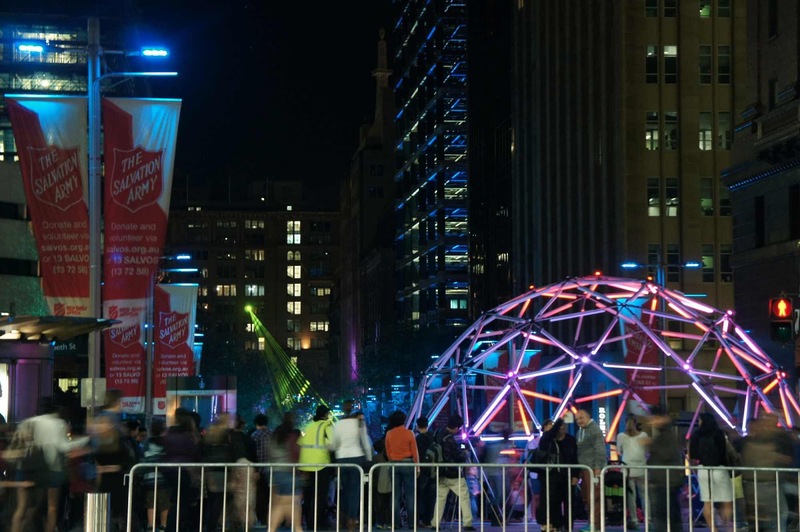 The Geo Glow Dome does even trickier things with LED lights to make things appear 3D. I couldn't get any closer than this, it was so popular. In between the feature areas of light display were little observation areas where it was a bit less crowded. I found this spot along Macquarie Street and it boasted a lovely view of the MCA. The Bridge always looks like a star, any night of the week. Even when it's not particularly dressed up. 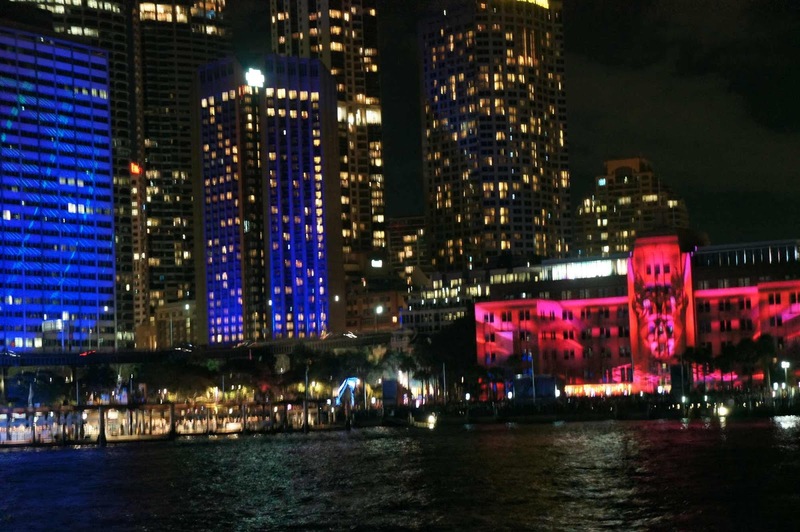 Special Vivid boats sailed the harbour all night. 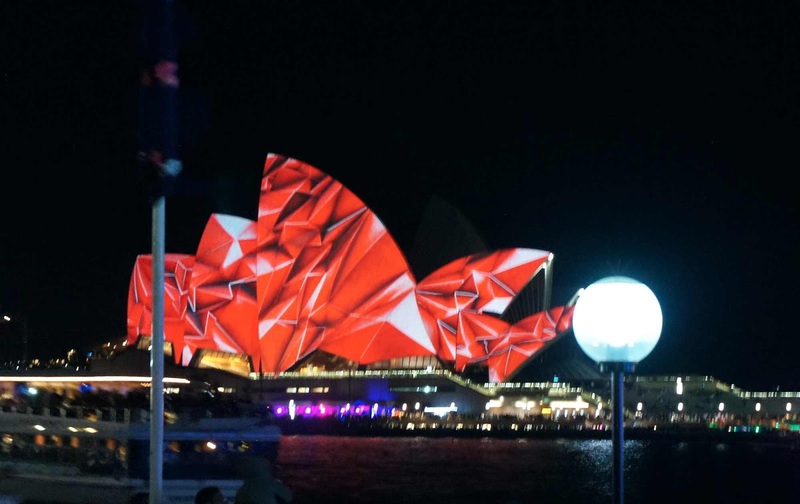 The centrepiece of Vivid is undoubtedly the Lighting of the Sails of the Opera House. Butterflies, reptilian scales, pieces of history and works of art - this year's images were created by a UK / USA art group called 59 Productions. One more of The Bridge because I can never get over how magnificent it looks at night. The Magic Circle by Tina Fox at The Opera House - light inspired by crochet. 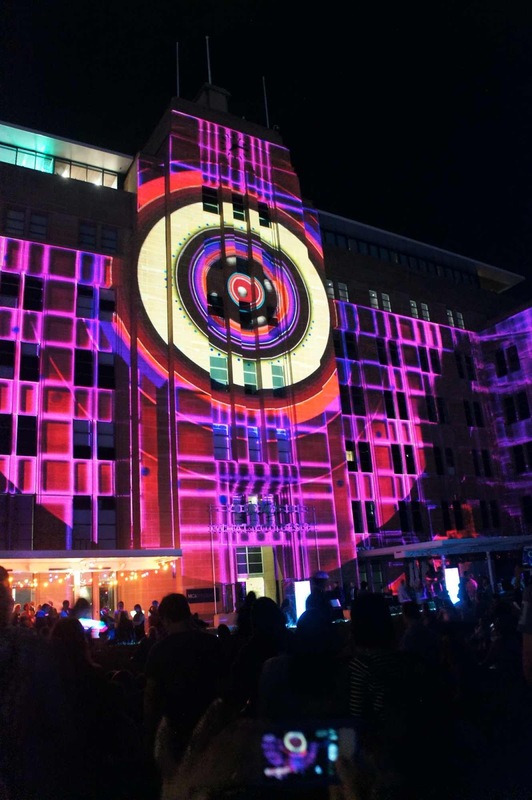 Filament Storm is a project that saw Sydney's skyline become a canvas for a riot of colourful lights and lasers. With Filament Storm dancing on the buildings above, the lights closer to earth did look more vivid. Aside from the traffic free zones, the organizers made sure that everything was clearly signposted. There was a large security and police presence who worked together to somehow get the amorphous throngs of people to keep left on walkways and to keep moving. 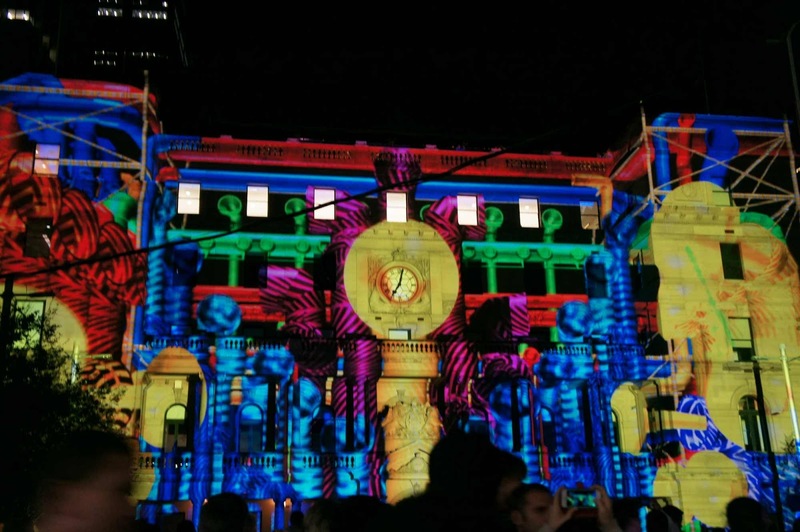 My light walk began at Customs House. Pulses of colour throbbed in time to a soundtrack that had everyone dancing on the spot, holding their iPhones / iPads / smartphones / DSLRs / tripods or children. The light's a bit bright but this is Tetrabin. 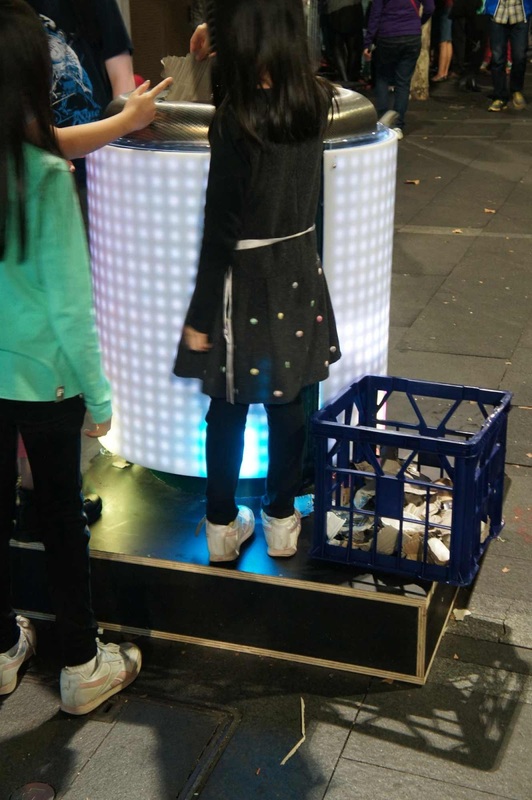 The little girls are putting piece of rubbish (thoughtfully provided in the blue crate) into the specially wired up bin as part of a computer game interface between responsible non littering citizens and rubbish receptacle. 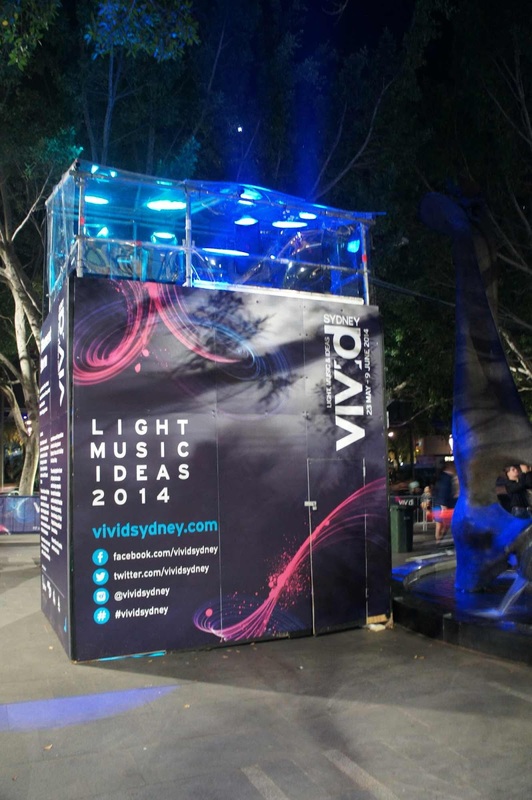 One of the many black boxes of magic responsible for the light and laser wizardry illuminating the streets of Sydney for Vivid. A close up of one the buildings caught up in the Filament Storm. The MCA forecourt was the place to be for Sydney's little ones. 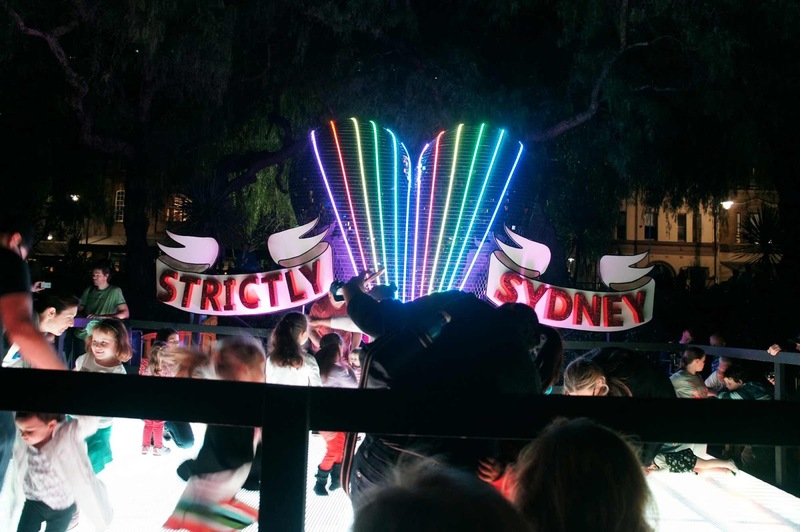 The MirrorBall heart that was the centrepiece for the final float of 2014 Sydney Mardis Gra Parade. Inspired by Strictly Ballroom and the proverb 'A life lived in fear is a life half-lived', the mirrorball was designed by George Savoulis and Ignatius Jones. Complete with a DJ spinning the decks and a a dedicated dance floor, the toddler set were going nuts as they celebrated freedom from their prams. You can never be too young to celebrate equality through dance, music and glitter. 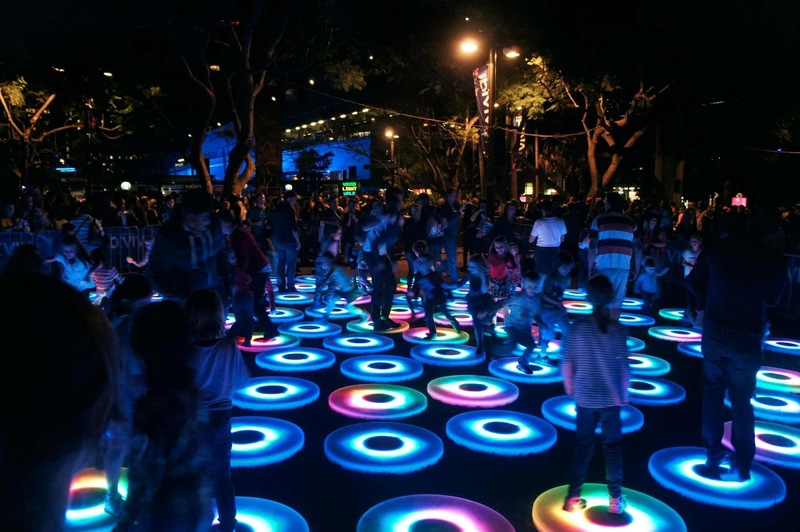 The Pool by Jen Lewin is a bed of concentric circles that light up as you leap onto them. 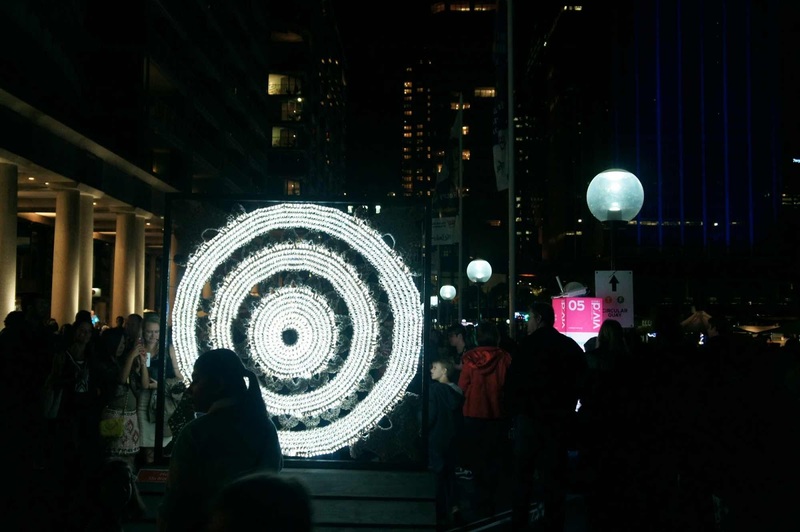 The circles contain pads that 'listen' to your footfalls and reply with changes in colour. I don't think I move fast enough these days to create any kind of light ripple. Best of leaving it to the youngsters, I think. 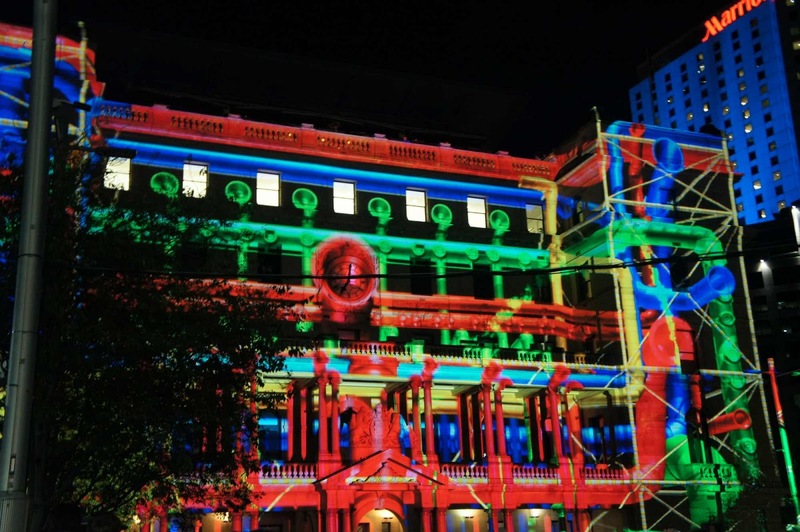 This year, the MCA was lit up in the designs of Jess Johnson. 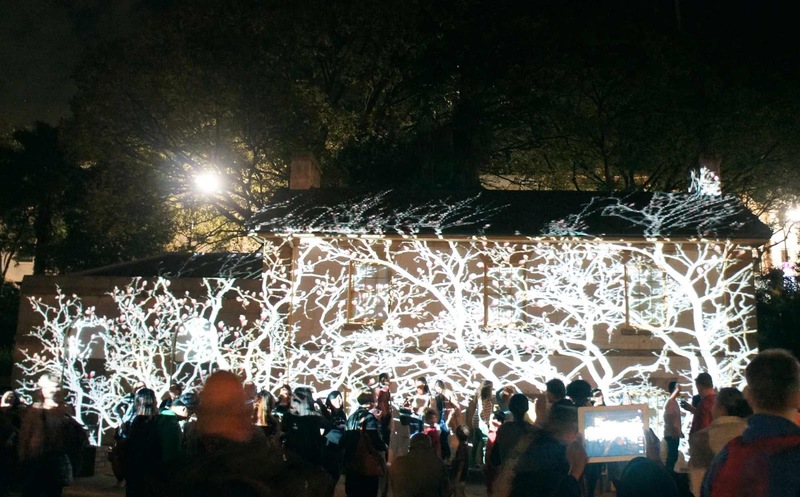 Mystery of Creation (Fragments of the Seasons) by Heinz Kaspar / Robert Faldner lit up a wall of Cadmans Cottage in The Rocks. 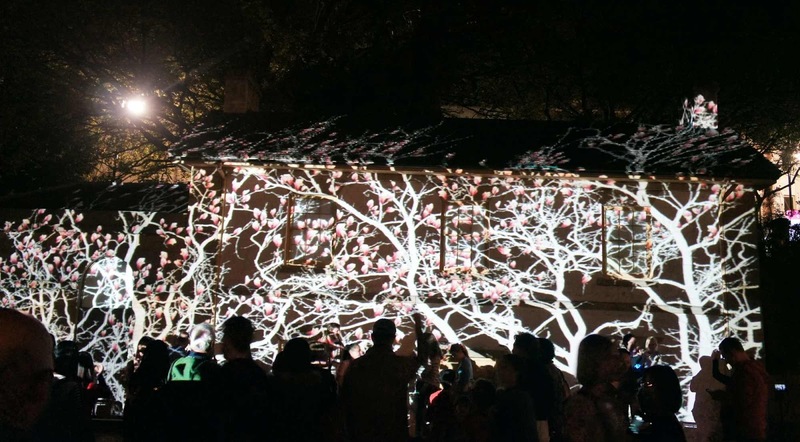 The ever changing branches of a tree looped and blossomed across the wall. Flowers blossom, only to wilt; trees wither, only to grow anew. The wind whispers in the tree; its leaves embody alchemy in the transformation of living colour, from green into yellow and red; leaves dance and drop off in a storm; and once again you see a bare tree. 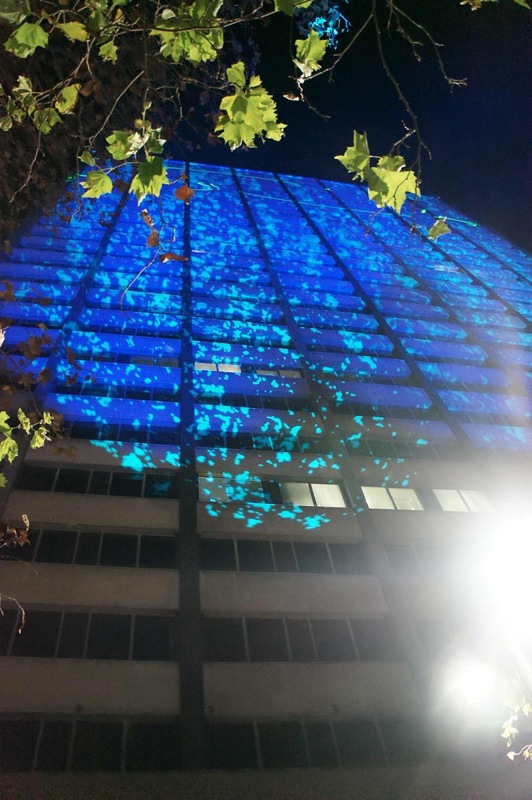 Nature and concrete brought together in the city by the art of light and music. Goodnight and thank you, Sydney. It was one of the most magical evening walks I've taken through the city in quite a while. Such beautiful photos! I would really like to come down and see this festival one year, I can imagine it's even more spectacular in person. Thanks, Mica! 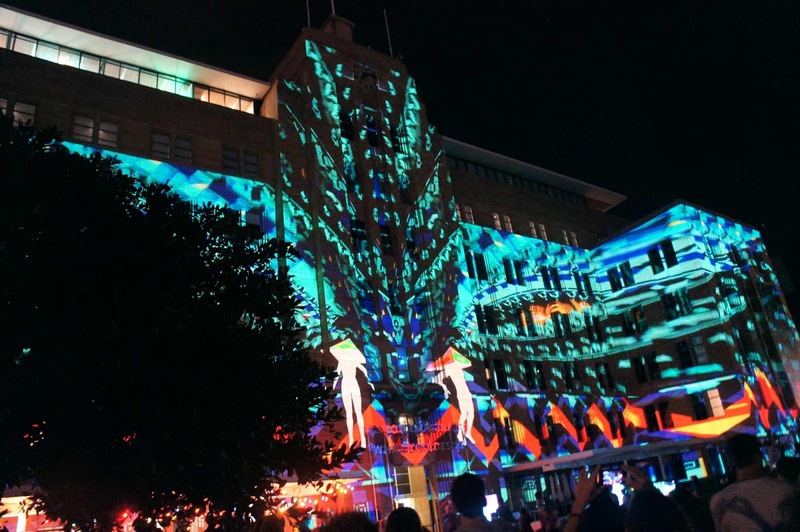 You definitely need to make it over to Sydney one year for Vivid. It keeps on getting better each year. Amazing! Every year i see Vivid blog posts and did you take baby SSG? I always get too scared to take kids to a busy event. The crowds have gotten more and more hectic every year. The first year was fantastic - I walked around and took photos with ease. Last year was chaos - I gave up halfway through and went home! Good on ya for getting out there though. wow.... youre having so much funnnn.... great post! 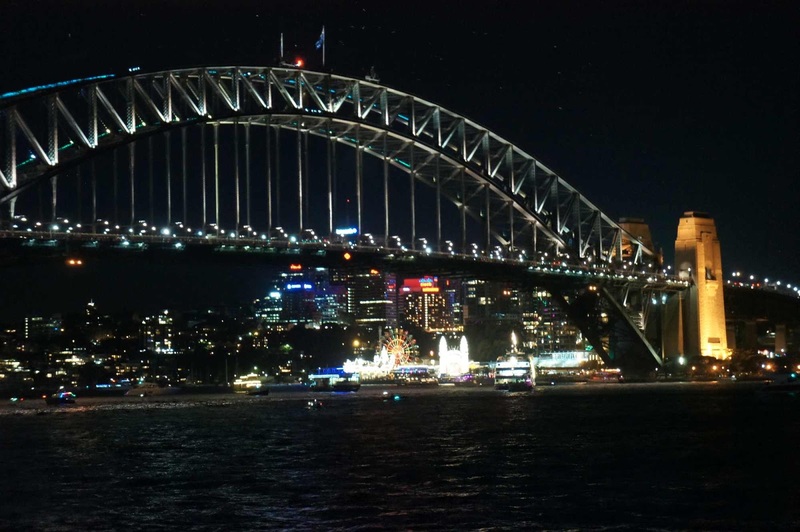 Indeed you have a magical journey in Sydney,,, Hope you also visited Nowra my homeland.